London Mills High School "Lions"
London Mills, Illinois (population 447) is about 20 miles south of Galesburg and 35 miles west of Peoria as the crow flies. It is located along the Knox-Fulton county line. The origins of the school system in London Mills can be traced back to as far as 1835. For 40 years, that school served the community until another was built in 1875 and another built in 1912. 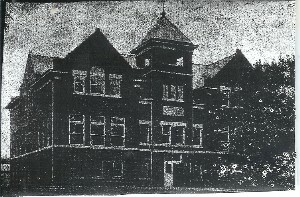 The 1912 building served the high school students of London Mills for the rest of it's existance. A gym was added to the building in 1936 and another addition was made in 1939. In the late 1940s, talks of a consolidation effort between London Mills, Maquon, Fairview and Ellisville took place. 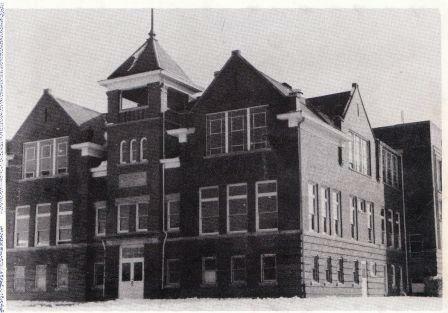 Spoon River Valley High School became a reality in 1948 with the high sclool located in Fairview. A newer high school building was built in 1973 and is located at Routes 97 and 116 with a London Mills address. The fate of the original London Mills High School building is a sad one as it has been razed. We are sure that London Mills offered Basketball as a sport. Did they offer other sports? They might have not won any IHSA hardware, but we are sure there were many successful seasons over the years. The baseball team of 1922-23 faired a little better then the boys did in basketball. The team finished with a record of 2 - 2, both wins coming over nearby Maquon. Members of the team included Keller, Harden, Mishler, Welch, Cook, Owens, Morey, K. Shreves, White, Benson, and Moshier. "I am not really familiar with this school except for the fact that my roommate at Bradley, during my freshman year, had a brother in law who graduated from this high school. His name was Roy Grieve, and he finished 4th in the 120 high hurdles and 2nd in the 200 low hurdles at the 1946 IHSA State Track Meet. He went on to become one of the best hurdlers in the midwest while attending Bradley University and was even selected by the old AAU to travel to Africa as a ASA team member on one of the summer track series from the late 40's early 50's era. Since I was a shotputter at Bradley, and shared a love for track with Roy, we became friends until his death several years ago." "A Stretch of Spoon River"
"I think that this place I am going to describe is one of the prettiest scenes I ever saw. It is about one-half mile stretch of Spoon River, prettiest in the summer time, some evening just after sun-down. When I go down to the water's edge, jump into the canoe and with one swift sweep of the oars, go sailing outinto the middle of the river, I look toward the farther end of this stretch and my heart thrills. The water is as clear as crystal. I look down and see a thin veil of clouds, which makes me feel like I am going to fall any minute down, down, through space 'till I reach the feathery clouds, far below. A slight noise causes me to look toward the banks, and there were two gray squirrels playing around on the fresh green grass, which comes down to the water's edge. Then they jump up into a hard maple opposite me as I float slowly down the river and are lost in the dark green leaves. On the opposite side of the stream there is a towering cotton-wood, the giant of the country, with its leaves quivering in the cool summer breeze. Tired from a hard day's work, I lie down at the bottom of the boat and view the clouds above me. Toward the west they are golden, then red and purple and above me they are a mixture between red and white, and farther east they are pure white. All at once this scene is shut off by a large elm, whose large green spreading branches reach almost across the river. As I pass out into an open space again, I see a solitary crow winging its way lazily toward the east and his resting place. Far in the distance I hear some boy calling the cows home. In another direction I can faintly hear some hogs squealing for their supper. All at once I am aroused from this peaceful scene by my mother's voice, a quarter of a mile up the river, calling me for supper. I turn the canoe and row slowly up the river, while no sound is heard but the splashing of my oars. I eat my supper and go to bed to have a good nights sleep." A scene that probably hasn't changed in all these many years!